Danfoss Variable Frequency Drives (Danfoss VFD or Danfoss VSD) are some of the most in-demand variable frequency drives around the world. Danfoss VFD are known for their precision speed control, their smoother operation and longevity. Starting current - A Danfoss VFD builds frequency and voltage over a period of time when starting off. Depending on the rate of acceleration and the load on the motor, the motor will consume significantly less current AC motors. Longevity - The reduced current demand at start-up also results in lower heat generation and less stress on the motor’s component. Both of these add to enhance the Danfoss VFD’s longevity. 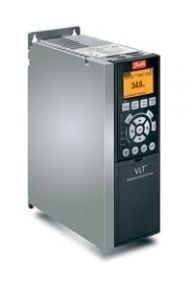 Controlled acceleration - Danfoss VFD allows granular acceleration control by the user. Acceleration ramps up smoothly from zero speed and ramps up smoothly. This is unlike AC motors, which begin abruptly, placing tremendous load system components. The abrupt start also sends a mechanical shock throughout the connected load. Controlled stop - Similarly, the production line or load can be brought to a gradual, smooth halt. Energy savings - A Danfoss VFD can yield substantial energy savings in instances of variable torque loads. It allows the user to match the speed of the motor driven equipment to the speed required by the process. Bauer GMC is committed to providing high quality motor products. To that end, we have partnered with Danfoss to offer their line of variable speed drives. We have a diverse selection of Danfoss VFDs, suited to a number of applications. The Bauer brand has been an industry leader in innovation and product development, consistently responding to customer demands in an ever-changing technological environment. Bauer GMC is a trusted retailer of Danfoss VFD. We bring over 85 years of experience and Canada-wide presence, offering full sales, maintenance and repairs on all our products. Our products are used in a plethora of industries, including food & beverage, material handling and automotive.